Erica Soto, Paola Mendivil, Kwesi Robertson, Amy Carpenter and Russell Olmsted discuss the uniqueness of our platform and need to tackle Grand Rapids' most important issues. We asked our community journalists their thoughts on writing for The Rapidian this year and the state of community news in 2017. Writing for The Rapidian this year has been an unexpected and greatly rewarding experience. My passion for writing about the community is a direct reflection of how I’ve been able to serve Grand Rapids. The Rapidian gives me a unique platform to do that. I’ve been able to challenge myself personally and step outside of my comfort zone as a writer in ways I never thought imaginable. For example, when the amazing and legendary band Antibalas released their newest album, I had the honor to interview and meet founder Martín Perna. I’d never interviewed a band, let alone had any music journalism background, but it was an experience I will never forget. I became inspired to pursue more challenges and step outside my comfort zone. Nowhere else, but through community media, would I have experienced that. Community news is like the oxygen mask of our society. It keeps us breathing when indifference and injustice knocks us in the ribs. We become more grounded and able to love when we can learn about and reflect on perspectives that are different from our own. We are the experts of our community. Community news helps to connect us to our truth. No one knows our reality better than us. Therefore, it is important that our stories have a safe outlet, especially when many of our communities are consistently silenced. 2017 was an emotional year for the news. Beginning with the new presidency, communities across the country faced challenges hard to imagine in modern history such as racist attacks, political injustices and inequality that brought residents concerns and division. Grand Rapids was not the exception. Through the year, The Rapidian shared many stories regarding important events impacting the community. I especially paid attention to the pro-immigration rallies and marches organized by Movimiento Cosecha, a nation-wide organization that supports the immigration reform. For some, it seems unbelievable all the different manifestations happening through the city all year; however, it is a time to reflect and be thankful for the great support and unity residents demonstrated standing up for what matters as well as raising our voice to the different issues impacting our lives, our education, our health, our safety and our families. I am proud to have been one of those voices making sure to bring an opportunity for dialogue and present new perspectives to the rest of the community. I am thankful that the Community Media Center strives to be inclusive in delivering the local news from one resident to another. Grand Rapids is an entrepreneurial mecca for startups. One of the best places to raise a family. An economical epicenter of endless possibilities. Just do a simple Google search and you will find out that Grand Rapids is home to five of the world’s leading office furniture companies and has been voted Beer City, USA in national polls. These headlines can be found in local, regional or national publications. We even have a grassroots campaign that has gone national, “Be Nice ”. All that is missing is a unicorn. Is this place even real? 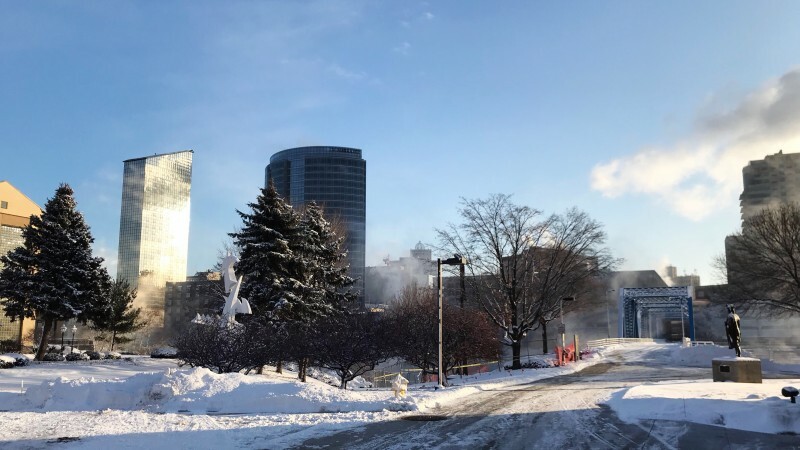 Writing for and reading various articles published by the The Rapidian has showed me that as cliché as it sounds, there is a tale of two cities of Grand Rapids. One for the haves and an entirely different one for the have nots. As I dipped my amateur toe back in the editorial waters for our hyperlocal pub, I had a disturbing realization (too little, too late) about the underbelly of this mythological city I live in. When it comes to economic opportunity, Grand Rapids credibility is lack-luster. Last year, our city ranked as the second worst city for African Americans. Do a little searching to find the embarrassing pay gap among whites and blacks within our city limits. It fills me with the anger of a thousand suns. When it comes to economic opportunity, Grand Rapids was last year ranked as the second worst city for African Americans in the entire country. While the median income for white individuals in the city is about $77,000 per year, it is $22,000 for black residents. As I stumble off my soapbox and reposition my stance and purpose of this article, why is citizen journalism important? I’m reclaiming the term #fakenews which is a very real thing, despite the Cheeto-colored loon that has Columbused this phrase for himself. If the news and entertainment channels and means of communication are already drumming to their own beat and agenda, then citizen journalism is our only means of defense, protest and resistance. This is not some conspiracy rant that I uncovered from society, the research doesn’t lie. According to a recent Color of Change and Family Story study, news media has had a significant hand in negatively skewing the perceptions of blacks (and I would gander brown) families. Mainstream media outlets and entertainment frequently promote false, negative and destructive portrayals of black families that don’t accurately reflect reality. Add the Pleasantville veneer of “nice” and you have now created a society and culture that actively hinders any “real” conversations and changes regarding race, class, gender or sexual orientation issues. The obvious value of citizen journalism is that there is little to no bureaucracy in creating honest and constructive conversations, content and stories spotlighting and inspiring people of color. Now the challenge is to get more people to read, create and share these marginalized stories for greater awareness, compassion and understanding. So far I’ve written 27 articles this year, most with an eye toward racial justice and equity issues. I started the year with a four-part opinion piece on how Grand Rapids continues to be an oppressive place for our Black neighbors especially. Throughout the year I worked to amplify the voices of Black organizers, immigrant leaders, and others who struggle to create equitable outcomes for themselves in this city. When police officers held 5 African-American boys at gunpoint, I made sure their parents’ voices were heard. When Father’s Day rolled around, I focused on the Burton Heights Reunion, a neighborhood event that many folks outside the neighborhood had never heard of. And when the Boston Square and Cottage Grove neighborhoods spoke out against AmplifyGR, my articles focused on their words and their efforts. This is the power of community news that I get most excited about. As I have watched myself and others develop as community journalists, I see that we have the power to highlight voices that are often not heard. At the same time, because The Rapidian does not pay for its articles, I notice that Black, Latinx, Indigenous, Disabled and other writers often cannot take the time and effort to write articles to represent themselves and their communities, even if they wanted to. We cannot continue to underpay and take for free the efforts of our neighbors from under-represented communities. Grand Rapids will never make steps toward the equity it says it desires if we are not willing to pay what we owe. With so much happening on the national level regarding politics, healthcare, and the economy it’s sometimes hard to remember the important issues taking place right here in our backyard. And in 2017 that backyard went through some huge renovations. From the ongoing affordable housing crisis, police reform, elections, new millage proposals, packed and emotional commission meetings, labor disputes, right on up to the retiring of our the current City Manager; this year has been full of challenges and changes for the people of Grand Rapids. We may not realize it all the time, but the decisions made here in our city shape our daily lives in ways that are truly unavoidable and have direct influence over how our community is molded and continues to grow. That’s why The Rapidian and community journalism is so very important. They help fill the void that’s been left by news outlets cutting back on coverage of local issues and civics. The best part is it consists of community members covering issues that affect them, their lives, and the people they care about. It’s honest. It’s heartfelt. And it’s necessary. For me it’s been an honor to volunteer my time in this effort. I’ve never thought of myself as a writer (some of you may be saying to yourself “yeah me either”) but The Rapidian has given me the opportunity to be engaged and help in a way I never thought possible. I look forward to continuing to write on these issues in the coming year and encourage you… yes you reading this right now… to jump in here with us and give it a try. We need your voice and so does your community.